In this project by Elisa Werbler and Wolfgang Kahler, urban farming was examined through the lens of the insect-plant relationship, where insect biodiversity is framed as the primary outcome of the system. The goal is to establish that design-for-insects is a path to a healthier, more resilient, and more productive ecosystem. Organic agriculture and Integrated Pest Management strategies address the relationship between plants and insects in great detail. In practice however—and particularly in smaller scale urban operations—these resources too often remain untapped until a problem arises. By cultivating diversity from initial planning stages, farmers can not only minimize damage from pests ,but also better harness the beneficial functions of insects as pollinators and soil builders. 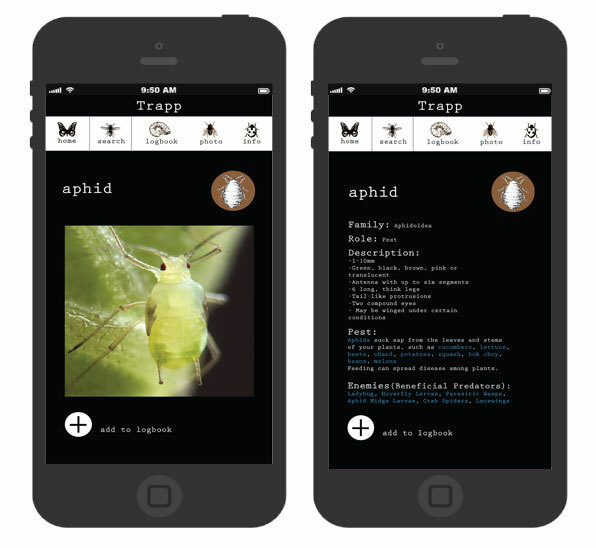 Trapp offers a convenient and focused resource for identifying insects and their role in an agricultural system. Users are able to search species through a number of avenues, as well as communicate with the online community about issues and solutions. It furthermore allows the user to log findings which might be visualized to show patterns over time. This information can then be aggregated to reveal larger regional and global fluctuation in insect populations. As the flaws of industrial agricultural strategies become increasingly apparent, a fundamental rethinking of the human-nature relationship becomes necessary. At its heart, this project is based in the idea that other members of an ecosystem should be addressed not as resources or enemies, but as allies.